SitNews - Daedal! Debonair! Daring! Definitive! Dragons! Daedal! Debonair! Daring! Definitive! Dragons! Ketchikan, Alaska - Ingenious and versatile ravens were the inspiration for a colorful and engaging educational dragon project at Houghtaling Elementary School. Ravens? Dragons? What's the connection one might ask. After attending the opening reception for Evon Zerbetz's raven exhibit at the Ketchikan Museum, Houghtaling Elementary School teacher Penny Ranniger said she found the exhibit so interesting and had so much potential for teaching that she approached Ms. Carson, another sixth grade teacher, to explore the possibility of doing a museum exhibit at Houghtaling that was based on the Raucous! Ravens exhibit. Both teachers agreed that the project had great potential to engage their students in real world application of the language arts, math and social skills they practice in school. 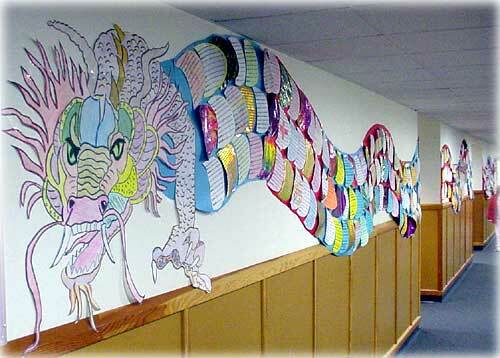 "Reading Dragon" Each of the scales on the dragon's body are miniature book reports submitted by all the Houghtaling Elementary School children. The Scaly book reports go down the hall around the corner, up the stairs, and continue down the hall -- almost 200' of book reviews! Before beginning the project Ranniger said the Houghtaling sixth grade classes toured the Raucous! Ravens exhibit in November. "Though they are the Houghtaling Dolphins, the students all thought that dragons were much more interesting than dolphins," said Ranniger. "They chose to do an exhibit on dragons. The Daedal! Debonair! Daring! Definitive! Dragons! exhibit was born," said Ranniger. "The students brainstormed a huge list of creative projects to put in their museum." Ranniger said, "In December, each student created his or her own dragon drawing based on ancient Chinese style dragons." Describing the project Ranniger said in Ms. Carson's and her [Ranniger's] classes, students chose from among five different projects to research, plan and complete for the museum. In Ms. Carson's class, the groups of students created a dragon board game, a large paper mache' dragon, a full size Chinese Dance dragon, a puppet show based on several dragon books, and dragon masks. 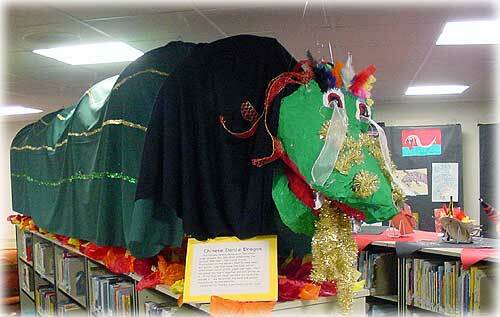 Several students also created dioramas based on dragon books they had read. In Ms. Ranniger's class, each student read and summarized a dragon legend from cultures around the world. In groups, they created a dragon lair, some recycled dragons, a living dragon display, skulpey clay dragons and a Chinese puzzle dragon. There was also a pseudo science project on what the best outfit is for fighting a fire-breathing dragon and a short video showing clips of dragons in the wild. Ranniger said in addition, each student read at least five books about dragons or with dragon characters and completed a scale to go on the "Reading Dragon" in the hall. The entire school was also invited to participate in the "Reading Dragon" by reading books and filling out a scale to put on the dragon's body. In just a few short weeks, the dragon stretched from the library downstairs all the way up the stairs and past the display case with dragon objects on loan from Houghtaling students. The culmination of this massive undertaking was a museum opening on Tuesday, February 7th. According to Ranniger, the turn out was great. Ranniger said, "The students were proud of their efforts and brought their friends and relatives to see it!" School board members and Harry Martin, Superintendent of the Ketchikan School District, also attended. According to Ranniger, over a hundred people toured the exhibit that evening. She said, "The rest of the student body has toured the museum during library time this week. Sixth graders have been on hand to act as tour guides and curators of the exhibit." "The teachers were pleased by the effort, enthusiasm, and creativity shown by their students throughout the unit. The collaborative aspect of each project challenged the students and provided ample practice in problem solving skills in order to accomplish each task," said Ranniger. "The "Reading Dragon" proved to be very popular with all of Houghtaling's students and staff. The scales reflect the diversity of our reading community. The museum exhibit was the spark that set the flame of imagination afire! What a great place to live!" said Ranniger.